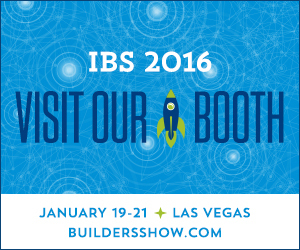 I’ve been attending the International Builders’ Show (IBS) for many years. But this year will be different. Instead of spending all of my time in education sessions, networking and checking out the exhibit booths; you’ll likely find me in our inaugural Marketing RELEVANCE exhibit booth. Since it is our seventh anniversary as a company, we’ve put together an awesome Lucky 7 themed booth for IBS in Vegas, January 19-21, 2016. IBS is the largest annual light construction show in the world, attracting 50,000 visitors from more than 100 countries each year. IBS has more than 500,000 net square feet of exhibits and 1,300 manufacturers and suppliers of the latest and most in-demand products and services. We are all very excited about exhibiting and hope you will come by #C2665 in nextBUILD area to meet SEVEN members of the Marketing RELEVANCE team: myself, Carol Morgan, managing partner; Lauren Cooper, Account Coordinator; Megan Morgan; Graphic Designer; Bryan Nonni, Social Media Manager; Courtney Rogers; Account Manager and Doug Silk, SEO Coordinator. Our Lucky 7 themed booth is the perfect way for us to reach existing and prospective clients, and will be a special opportunity for existing clients from across the nation to get to meet some of our team members in-person. If you are looking for a marketing, communication and interactive agency for 2016, be sure to stop by to learn more about our products, services and approach. Of course, I will still fit in time for checking out others’ booths, networking and education. In fact, I’ll be presenting three education sessions. On Tuesday, January 19 at 3 p.m., I am part of panel presenting the Building Knowledge Session, “The Great Debate: Millennials or Boomers?” Carol Morgan, Marketing RELEVANCE Managing Partner and I will present “Mobile Marketing – Engage Your Customers Via Your Website,” in Remodeling Central on Thursday, January 21, at 11 a.m. and an IBS Live presentation, “Search Engine Optimization & Social Media are Like Chicken & Waffles” on Thursday from 1:30 – 2:15 pm. What would a proper exhibit booth be without some killer swag and giveaways? We will have plenty of both. But the heart of the booth really has to do with Return on Investment (ROI) and how Marketing RELEVANCE is a “Safe Bet for Your Marketing Dollars.” Visitors will learn about all of our services – social media, public relations, website design, marketing strategy, creative design and more. I will see you there! It’s booth, #C2665, in the nextBUILD area. We will be giving away an Apple Watch™ a day, and most importantly, will be building new relationships (and building upon existing ones). We hope you stop by! Visit www.buildersshow.com to learn more about IBS. Next story Which Generation is Shaping Housing Today? Previous story The Awards Just Keep Rolling in for Marketing RELEVANCE!